In April 2002 the Philadelphia Museum of Art held a symposium in conjunction with a major retrospective of the work of Barnett Newman (1905-1970). This volume publishes the proceedings of the event. With contributions from notable specialists in the field, including art historian... read full description below. Contributions by Friedman, B. H.
In April 2002 the Philadelphia Museum of Art held a symposium in conjunction with a major retrospective of the work of Barnett Newman (1905-1970). This volume publishes the proceedings of the event. With contributions from notable specialists in the field, including art historians, museum curators, critics, conservators, and fellow artists, the book pays homage to Newman and sheds new light on his work as a theoretician and innovator. 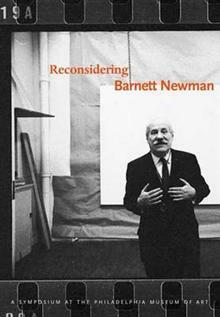 The essays collected in Rediscovering Barnett Newman discuss the artist's famous zip , his late series of paintings The Stations of the Cross , the temporal aspect of his works, his painting technique, and his sculptural oeuvre, among other topics. As a whole, this wide-ranging collection provides new perspectives on one of the twentieth century's greatest artists, whose work continues to inspire and to speak to contemporary audiences. Melissa Ho is an artist and art historian who assisted in organising the exhibition Barnett Newman at the Philadelphia Museum of Art in 2002. Other contributors to the volume include Mel Bochner, B. H. Friedman, Mark Godfrey, Ben Heller, Carol Mancusi-Ungaro, Robert Murray, Suzanne Penn, Sarah K. Rich, Nan Rosenthal, Pierre Schneider, Gabriele Schor, Richard Shiff and Allan Stone.